“Hold on, Buddy. We are going to get you out of here,” says team captain Casey Slaughter, his voice distorted through his rebreather mask. Slaughter, an S&T graduate student in mining engineering from Webb City, Mo., barks out commands to the team as the five stabilize the mine’s roof and remove the miner on a wheeled stretcher. Back on the surface, they wrest off the Velcro straps surrounding the miner and he rises and smiles. This has all been a training exercise at Missouri S&T’s Experimental Mine Facility, which has been drilled out between the railroad tracks and a quarry on the west side of Rolla. Missouri S&T Mine Rescue has two teams practicing for the Southern Regional Mine Rescue Contest in New Iberia, La., on May 7-9. Slaughter’s team is coming off of a first-place finish in the underground rescue competition during the Missouri Mine Rescue Contest in October 2012, held at S&T’s Experimental Mine. Judges from the federal Mine Safety and Health Administration evaluated Slaughter’s team, another S&T team and 12 professional mining industry teams on how they handled a simulated underground disaster situation. Although the S&T teams had a home-court advantage, they also competed against industry professionals who work together daily. It’s kind of like a semi-pro football team going up against a professional football team in the NFL,” Slaughter says. Since the rescue team is literally linked together by a cable, which also relays audio to surface rescuers, familiarity with the rescuer next to you is a plus. Being linked up with others in mining helped Slaughter in a different way — when he looked for internships, teaching opportunities and a job after graduation. “What helped were the contacts I made through the S&T Mine Rescue Team. 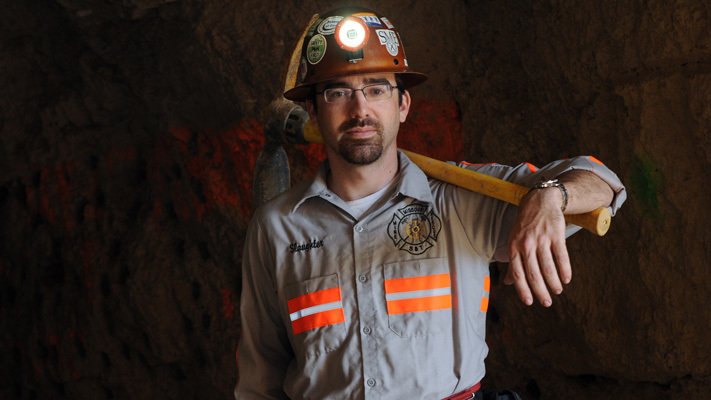 That’s where I got all my internships and two trips to China to teach a short course on mine rescue,” Slaughter says. This summer, Slaughter will work in a different land down under, when he helps Monash University in Melbourne, Australia, start a mining engineering program. I can pretty much write my own meal ticket now with my degree and experience from Missouri S&T,” he says. Slaughter plans to graduate with his Ph.D. in 2014. More videos produced by Missouri S&T communications.